Kung Tsui-chang, right, at a ceremony in the Confucius Temple in Taipei, Taiwan, on Sept. 28, 2007, honoring the ancient Chinese philosopher.Credit Courtesy of Zhang Jingjing. 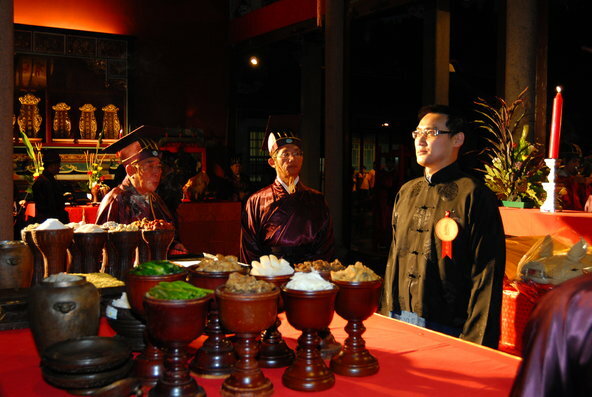 Kung Tsui-chang is a 39-year-old businessman in Taiwan who is the 79th-generation direct descendant of Confucius. He inherited the title of Sacrificial Official to Confucius from his grandfather, Kung Te-cheng, who died in 2008. The position was created by the Republic of China in 1935 after it abolished the title of Duke of Yansheng, a noble rank in Imperial China given to the descendants of the Chinese scholar and philosopher. While the Dukes of Yansheng had special powers over Confucius’ domain in Qufu, Shandong Province, the modern-day Sacrificial Official to Confucius’ role is limited to officiating over annual ceremonies in Taiwan that commemorate the Great Sage. But though the privileges attached to his own hereditary title have diminished over the past century, and Confucianism came under violent assault in China for much of the second half of the 20th century, Mr. Kung says that in recent years he’s seen the appreciation for Confucian thought grow. Q. As a descendant of Confucius, did you feel any particular pressure growing up? What sort of expectations did your parents have? A. I remember that ever since I was a child, my family did not put any particular pressure on me. My parents wanted me to know how to treat people politely and to always behave and conduct oneself in an upright and honest way. I grew up with three generations under one roof, in a home full of books. It was what could really be called a family of intellectuals. When my grandfather was alive, he was rigorous in his scholarship, always with a book in his hand. And when he wasn’t reading, he was writing. Growing up in such an environment, I developed a complete respect for knowledge. As an adolescent, I studied “The Analects” and other classics of Chinese traditional culture just like my peers, and I didn’t feel anything special compared to the other students. Each year, my grandfather officiated over the sacrifices to Confucius. My general feeling was that was a matter for adults and something very distant from me. I felt that way up until a year before my grandfather’s death, when because of health reasons, he asked that I conduct the rites. It was then when I became conscious of my future path. It’s a responsibility and also an honor. Q. Have you been to Confucius’ hometown of Qufu? What sort of relationship do you have with your family in mainland China? A. After 2009, when I became the Sacrificial Official to Confucius, I founded the Chinese Association of Confucius, in May 2011, in order to spread Confucian thought and culture. In August of that same year, I went to Qufu for the first time with my mother, my wife and 20 association board members. The people there put great importance on our reception. I conducted a ritual at the Confucius Temple, and also toured the temple, the Confucius Family Mansion and the Confucius Research Institute and a few other spots. The year after, on Grave Sweeping Day, I participated in the spring ceremony held at the Confucius Temple on Mount Ni, and Confucius’ descendants together conducted the family rites at the Confucius Cemetery. This was all public, and some media outlets covered it closely. Last May, I went to Qufu again, and in addition to visiting the Confucius Research Institute, I accepted the honorary title of dean of the Qufu Normal University’s school of Chinese national culture studies. On the mainland, my closest relative is my great-aunt in Beijing. She’s my grandfather’s older sister, Kong Demao. This year, she’s 98 and still in good health. When I went to Qufu in 2011, I made a trip to Beijing to see her, and I saw her again this May. Now we’re in close touch. Q. What do you think Confucian thought can contribute to modern society? A. Confucian scholars could do a paper on this topic. I will just simply share a few personal thoughts. Confucianism has already been the body of Chinese tradition for more than 2,000 years, and has deeply influenced East Asia and a few other countries. Thus Confucianism is a precious cultural property of the Chinese people and is also a treasure for mankind’s spiritual culture. Although mainland China has emerged from a period of questioning and denial of Confucianism, with social development, people’s growing awareness of Confucianism’s meaning and value for modern society, the revival of Confucianism in mainland China is already commonplace. From the situation on the mainland, you can see, after undergoing more than a century of attacks, Confucian culture is in the midst of a revival. Confucianism has a great influence on elevating people’s spiritual qualities, and can help raise the level of morality and construct a harmonious society. In addition, from a global perspective, some ideas of Confucianism, such as “Do not do unto others what you do not wish done to yourself,” the unity of heaven and earth, people as the foundation and so on are now receiving more cross-cultural recognition as fundamental values that can help solve international conflict, the ecological crisis and other serious modern problems. Q. Recently, Confucius’ name and Confucian thought have been much more commonly discussed in mainland China. President Xi Jinping visited Qufu last year and spoke of his interest in Confucius. What do you think about this trend? A. After decades of cultural ruptures, mainland China has once again in recent years recognized the importance of Confucian thought and culture to social development. Of course this is a good phenomenon. I hope that Confucianism in mainland China will not only revive but continue to develop and spread for the sake of peaceful development worldwide. Q. Who is Confucius’ representative today? A. Over 5,000 years of Chinese history, Confucius is the greatly accomplished and most sacred teacher. His descendants can’t hope to achieve his level of civilization. I am proud to be a descendant of Confucius, but I wouldn’t dare consider myself as his representative. Q. What do you think of the recent inclusion of female descendants of Confucius in official genealogies? A. In the past, women weren’t included in the genealogies of the Kung family. This was because at that time, women didn’t have high status in society. But with the progress of time, women’s social status has been greatly elevated. So now in keeping with social development, female members of the Kung family are included in the ancestral records. Likewise with the Sacrificial Official to Confucius, for which the Republic of China in 2009 modified the regulations on inheritance of the position. Under the rules of the “Points on the Sacrificial Offers and Commemorations of the Greatly Accomplished and Most Sacred Teacher Confucius,” the Sacrificial Official to Confucius is inherited by Confucius’ descendants. The person who inherits the position must be surnamed Kung. This rule stipulates if there is no male descendant who can take up the position, then a female descendant can take it. Q. Do you have a relationship with the Confucius Institutes, the schools China is sponsoring around the world to promote Chinese language and culture? What do you think of them? A. I have no relationship or contact with the Confucius Institutes. I don’t know much about the situation, so I can’t comment. Q. What do you teach your children about Confucius? A. I have a son and a daughter in third and first grades, respectively. I believe that a child’s education should be suitable to normal development, and they shouldn’t receive any special pressure because of their identity. I hope they grow up lively and healthy, and develop their moral, intellectual, physical, collective and aesthetic education. In fact, Confucian thought is already internalized in most Taiwanese people’s behavior, including our household. Posted in History, Society, Taiwan	Bookmark the permalink.